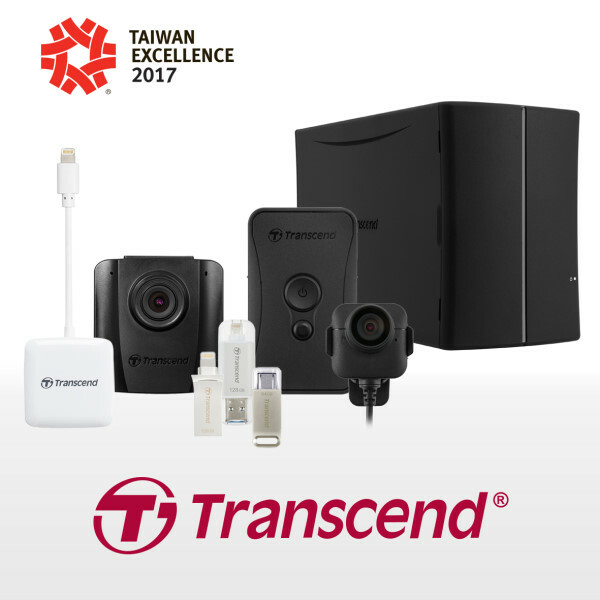 Transcend Information, Inc., a worldwide leader in storage and multimedia products, is proud to announce that seven of its cutting-edge products have been awarded the 2017 Taiwan Excellence Award. The winners include the DrivePro 50 dashcam, the DrivePro Body 52 body camera, the JetDrive Go 300 and JetDrive Go 500 Lightning USB 3.1 flash drives, the RDA2 smart reader, the JetFlash 850 Type-C USB flash drive, and the StoreJet Cloud 210 personal cloud storage device. The Taiwan Excellence Awards are granted by the Taiwan External Trade Development Council (TAITRA) on behalf of the Ministry of Economic Affairs. Nominees are put through a rigorous evaluation based on five criteria - R&D, design, quality, marketing, and being made in Taiwan. According to TAITRA, 528 products from 203 companies received awards this year. Extremely compact, the DrivePro 50 can be affixed behind a rearview mirror without obstructing a driver’s view. The DrivePro 50 boasts a large F/1.8 aperture that can capture all details of an incident even during nighttime. The dashcam comes with built-in Wi-Fi connectivity to let users stream, download, and share videos directly from their smartphone or tablet. In addition to the Taiwan Excellence Award, the DrivePro 50 also received Japan’s Good Design Award 2016. Tailor-made for law enforcement, private security, and other professionals, Transcend's DrivePro Body 52 body camera is a dependable piece of equipment that helps to collect critical evidence of incidents while on duty. The DrivePro Body 52 features a camera unit connected to the main unit by a flexible cable, Full HD video recording, a large aperture, a wide-angle lens, and a conveniently located snapshot button. In addition, the camera boasts built-in Wi-Fi for live-streaming on mobile devices via Transcend's exclusive DrivePro Body app, available for both Android and iOS devices. Transcend’s JetDrive Go 300, JetDrive Go 500, and RDA2 smart reader are designed for use with iOS devices. The JetDrive Go 300 and JetDrive Go 500 feature both a Lightning connector and a USB 3.1 (Gen 1) connector. With the exclusive JetDrive Go app, users can manage and transfer files between Apple iOS devices and PCs, expanding device storage space by up to 128GB. Transcend’s RDA2 smart reader is equipped with a Lightning connector and slots for both SD and microSD cards, allowing users to upload or share photos and videos to social media quickly. Transcend’s Smart Reader app opens up extra features for the RDA2 including data backup, card formatting, file encryption, file compression and decompression, direct save of audio recordings to memory cards, and fast access to cloud storage. Equipped with the latest USB 3.1 Type-C connector with USB OTG (On-The-Go) technology, Transcend’s JetFlash 850S flash drive delivers transfer speeds of up to 130MB/s. The JetFlash 850S also features an ergonomic curved grip for greater comfort. Employing innovative COB (Chip on Board) technology and housed in a metallic casing, the JetFlash 850 is fully resistant to dust and splashes. To satisfy customers’ increasing need for remotely accessible data storage, Transcend’s StoreJet Cloud 210 offers personal storage space of up to 8TB. With this device, and in contrast to public cloud services, users have total control over their data. Featuring mobile access and sharing, automatic data backup, and media streaming, Transcend's StoreJet Cloud 210 offers fast transfer speeds, enabling users to access and share data wherever they are. In addition, with built-in RAID 1 data mirroring technology, Transcend's StoreJet Cloud 210 protects data integrity through redundancy. This year marks the 13th consecutive year Transcend has received Taiwan Excellence Awards. With nearly 30 years of technical experience and expertise, Transcend has also received many other prestigious design awards, including Germany's iF and Red Dot awards, Japan's Good Design award, and Taiwan's Innovation awards.